Saddell Abbey is little more than a heap of ruins. But though the site is a stony shell of its former self, it still holds wonderful treasures from its past. Just before you approach the ruins, you’ll come across a dozen large, carved stones safely nestled within a shelter built to protect them from the elements. 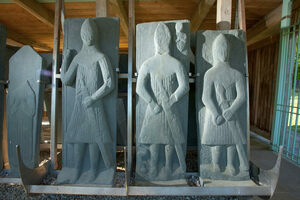 These enormous grave slabs, which date from the 14th through 16th centuries, are a sight to behold. Each slab features an effigy of the body once buried beneath it. Stand before the mighty markers, and you’ll spot depictions of what look like lords donned in full armor, knights, and priests. It’s believed that the largest of the four stones were carved on Iona, an island home to one of Western Europe’s oldest centers for Christianity. Saddell Abbey itself dates to 1160 CE. It was all but abandoned by the second half of the 14th century, though burials continued to take place. The site also contains a holy well, which trickles into a 19th-century stone basin.